The maker of this video is apparently Hetman Ostap — From his channel page in YouTube (noobfromua), it looks like he’s a student in Ukraine. This is another example of what I wrote about earlier this year, that people outside the US, often in obscure places, seem to do great work on the Web — Making a video of the Body Browser seems like such an obviously good thing to do — Why did it take a Ukrainian student to do it? http://bodybrowser.googlelabs.com/ … If you’re using a supported browser, this link will put you directly in the Body Browser. If not, it gives information on browsers that work. Posted in Google, PicsNo, Uncategorized, Wide World. In another article, I’ve discussed the idea of the WIDE WORLD Web — the idea that people with significant connections outside the US have made disproportionately large contributions to innovation and quality on the Web. I suggest in that article that one reason for this is that Wide World people seem to have a particular appreciation for Storytelling. Here, then,I’ll discuss examples of this from articles I’ve written. The outstanding example of resonance between the Wide World community, storytelling, and the Web is certainly British-Indian novelist Salman Rushdie’s tantalizing word picture in Haroun and the Sea of Stories that I see as an envisioning (prediction?) of the Web. Rushdie, of course, was raised as a Muslim in India, and his “stories within stories within stories” style in Haroun resonates equally with One Thousand and One Nights and with the Web that we experience, with its “liquid tapestry of breathtaking complexity,” to borrow Rushdie’s words. I’ve gotten new insights into storytelling and the Web in following the active brain of Bulgarian blogger and storytelling fan Maria Popova. She coined the phrase “controlled serendipity” that spread virally last winter after being headlined in a NY Times article by Nick Bilton. As I wrote in my commentary about that article, I think the reason the phrase resonated so strongly with people is because it captures the essence of how we use the Web — To follow stories, and make new stories ourselves. So I see Popova as another example of a heightened appreciation of storytelling from the Wide World community. Popova combines her interest in storytelling with a strong interest in TED conferences (popularized on the Web as video stories told by prominent people), and I learned to see the TED-Storytelling connection from her. Beyond Popova, TED provides another example of the Wide World community and storytelling — TED Curator Chris Anderson grew up in Pakistan and India — the land of Rushdie — and it certainly seems possible that this experience helped to foster his building TED into a prime Web storytelling spot. Posted in PicsNo, Rushdie, Storytelling, TED, Uncategorized, Wide World. In another article, I’ve discussed the idea of the WIDE WORLD Web — the idea that people with significant connections outside the US have made disproportionately large contributions to innovation and quality on the Web. I suggest in that article that one reason for this is that Wide World people seem to have a particular appreciation for Simplicity & Elegance. In this article, I’ll discuss examples of this. Tor Ahlenius was a librarian at the Karolinska Institute library in Sweden. I first observed the surprising quality of Wide World web work when looking for quality link-lists in pre-Google days, and found that Ahlenius had the most elegant lists on the Web in health and medicine. Beyond Ahlenius, I found in working on Hardin MD that many others of the best link-lists were also from outside the US. Some may question the idea of characterizing link-list-keeping as “elegant” — But in pre-Google days it was an essential service, and comprehensive and well-maintained lists were difficult to find — A simple but critical skill, perfected to elegance by Ahlenius. Moving forward and on a much larger stage, a couple of examples that are fairly well-known, but not usually thought of as having connections outside the US. But I’d suggest that they do indeed. 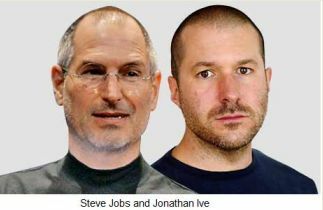 Steve Jobs, Jonathan Ive, and Apple – Jobs was raised in California by adoptive American parents, but his biological father was from Syria. The secretive Jobs rarely talks about this, but I don’t think it’s unreasonable to see a connection with his career as a tech-genius. Jonathan Ive, who made the elegant designs of the iPhone and iPad, has solid Wide World connections, being a native of England. Sergey Brin and Google – How would the world be different if he hadn’t moved from the USSR to the US when he was six years old and grown up to help invent Google’s elegant search and design revolutions? Twitter was not developed by anyone with Wide World connections, but I’m including it because it’s elegant simplicity has been so firmly embraced by the Wide World community. I especially learned to appreciate this from following the prolific tweeting of Portuguese librarian Jose Afonso Furtado. He tweets mostly on library/publishing subjects, but during the serious outbreak of Swine Flu in Mexico in 2009, he tweeted on that and I made good international contacts on Twitter through him. Tim-Berners Lee and the WWW – Lest we forget! — The Inventor of the Web was from England. As John Naughton says in his excellent profile of Berners-Lee, TBL’s great contribution was that he created a simple, elegant way to make hypertext, which had been around for several decades, usable by non-geeks — The World Wide Web. Luis von Ahn, who grew up in Guatemala and is now on the faculty at Carnegie-Mellon – CAPTCHA inventor and MacArthur Genius Grant winner at age 27. He also was the developer of Google Image Labeler, an elegant application of crowdsourcing/gaming to tag pictures. Yuri Selukoff – A very recent Wide World rising star – Russian developer of GoodReader, widely hailed as the best PDF reader for iPhone and iPad (and one of the two top-sellers of all iPad Apps). The simple, elegant trick of GoodReader is that it extracts pure text from PDF files and “reflows it” into wrapped text format. Selukoff’s GoodReader work reminds me of Tor Ahlenius, discussed at the top of this article, which was my first discovery of simple, elegant Web work originating from the Wide World community. As with Selukoff and GoodReader, it makes me wonder — Why does it take someone from outside the US to give the world such a simple, useful tool? Posted in Apple, Elegance, Google, Hardin MD, PicsNo, Steve Jobs, Twitter, Uncategorized, Wide World. I first noticed the disproportionate contributions from people with connections outside the US in the early days of Hardin MD. Before Google and PageRank the best lists of links were done by humans. In making Hardin MD, I kept close track of human-generated lists around the Web in health and medicine. A strong impression I got was that a disproportionate number of the most carefully chosen and well-maintained lists were from outside the US. A couple of examples — Tor Ahlenius at the Karolinska Institute library, whom I recently eulogized, and Ildo Shin, a physician in South Korea whose MedMark lists were by far the longest available, and had among the lowest rate of dead links (a common problem in those days). With Americans being the preponderate population of the web-using world, why was it that it was people in other countries who managed to master the simple task of keeping good lists? I think it has to do with simplicity — I think maybe Americans have trouble cutting through the distractions on the Web that yell out for attention, to cut through the fluff to see what’s really important! I’ve seen this same tendency as the emphasis on Hardin MD has changed from meta-list making to pictures — I find that many of the best sites for medical pictures are also from around the world. The Hardin MD Skin Disease pictures page, for example, has sites from Sweden, Germany, Pakistan, New Zealand, Saudi Arabia, Israel, Taiwan, and Nigeria. As with lists in Hardin MD, the important element here that’s captured by non-US people, I think, is the vision to take advantage of the simple virtues of the Web to accomplish a simple task — presentation of good medical pictures. So, having been sensitized by my work on Hardin MD, I’ve broadened my observation over the years to see how an appreciation for simplicity and elegance has become central to the Web/Tech world of Google, Twitter, Apple. I continue the story of how people from the WIDE WORLD community, with connections outside the US, have made significant contributions emphasizing simplicity and elegance. Posted in Hardin MD, PicsNo, Uncategorized, Wide World. In my early work with Hardin MD, I observed that some of the best contributors were from outside the US. I’ve observed something similar on the Web in general, that people with significant connections to other countries excel in Web work disproportionately to their numbers. Several articles on this blog are on subjects that relate to the excellent work done by people around the world, so I’ve been thinking about a category name to bring these articles together. I discussed earlier the idea of using World-Wide for this, but that doesn’t distinguish the idea from the good ol’ “world-wide web,” so I’ve decided to give it a bit more branding and uniqueness by using the category WIDE-WORLD to denote strong connections outside the US. In a separate article I’ll talk about how I discovered the concept of the WIDE WORLD web, starting with my work with Hardin MD, and broadening over the years to Google, Apple, and Twitter. In other articles, I’ll extend this discussion — emphasizing especially stories I’ve written about on this blog — and say why I think it is that WIDE WORLD users have made contributed so disproportionately to building the Web. In short, I’m suggesting there are two reasons for this — First, the valuing of simplicity & elegance and second, a heightened appreciation for storytelling. Posted in PicsNo, Uncategorized, Wide World. When Google first came out its ability to find thousands of links and to put the best of them at the top of the list was considered downright spooky, in the words of one doctor. We’d never had anything like that — Before Google, the choice was a human-generated list — either a relatively short list of subjective “best links” or a long, boring alphabetical/classified list — or, even worse, a search-engine list, that often seemed to be totally random. And then there were Tor Ahlenius’ elegant lists of Diseases and Disorders at the Karolinska Institute Library in Sweden. Tor had the uncanny ability to make relatively lengthy lists with the best links at the top. There was never any indication about the criteria used to choose the “best,” but it was clear that the top links were, in some sense, “high quality.” Often, these were links that I had come across on other peoples’ link lists, but sometimes there would be gems that I had never seen linked anywhere else. When Google revolutionized searching with its PageRank technology, I had the uncanny feeling that I had gotten a pre-taste of Google in Tor’s lists — His simple, understated lists were just like Google’s — “Give me all the sites on the subject, and put the best ones at the top.” And, of course, it was all out of his head. Tor’s pages resonated with Google not only in the quality of their links but also in their simple design — just the links on a spare white page. Another part of the appeal of Tor’s link lists for me was that he tended to put sites with good pictures toward the top. Although I’ve never seen this written about, I think Google has a similar tendency. And, as I’ve learned from Hardin MD stats, pictures are indeed popular. 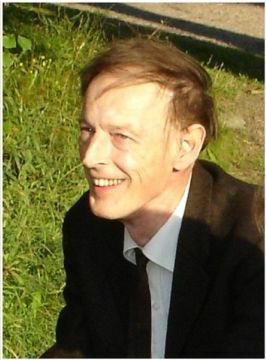 At the recent Medical Library Association annual meeting in Washington DC, I learned from Tor’s friend Arne Jakobsson, who was attending from Norway, the sad news that Tor died in early May, after having retired a few years ago. Tor had the mind of a scientist – He had a PhD in Quantum Chemistry and had done computer programming earlier in his career. As someone has said, if there were enough really smart people, computers wouldn’t be necessary — People could do it all. Of course that’s not possible in the real world. But Tor was a shining example of how its not so unimaginable. In the height of his list-keeping, I’d take the lists generated by his brain over Google anytime. Tor’s lists are still available — I suspect he continued to work on them until the end. Thank you to Tor’s family and Ylva Gavel at the Karolinska library for the picture of Tor. Posted in Elegance, Google, Libraries, MLA, PicsYes, Uncategorized, Wide World. In a presentation at the recent Emerging Technologies in Academic Libraries (#emtacl10) conference in Norway, Ida Aalen challenged librarians with her talk I’ve got Google, why do I need you? – A student’s expectations of academic libraries (SlideShare | PDF). Aalen is a media & communications graduate student at the Norwegian University of Sci&Tech, the site of the conference. Several of her slides were good, but the one I liked most is the one at left “I gave up this …,” a screenshot of an overly complicated library catalog interface that she contrasts with Google. Aalen’s slide especially caught my attention because it resonates so strongly with my recent article and graphic that makes the same contrast between the simple interfaces of Apple and Google and the busy interfaces of library catalogs. Seeing the similarity of Aalen’s ideas and my article, I’ve changed the second slide in the sequence at left, to highlight the contrast between the simple Google interface and complicated library interfaces. The top part of the graphic (I gave up this) is pretty much the same as Aalen’s. 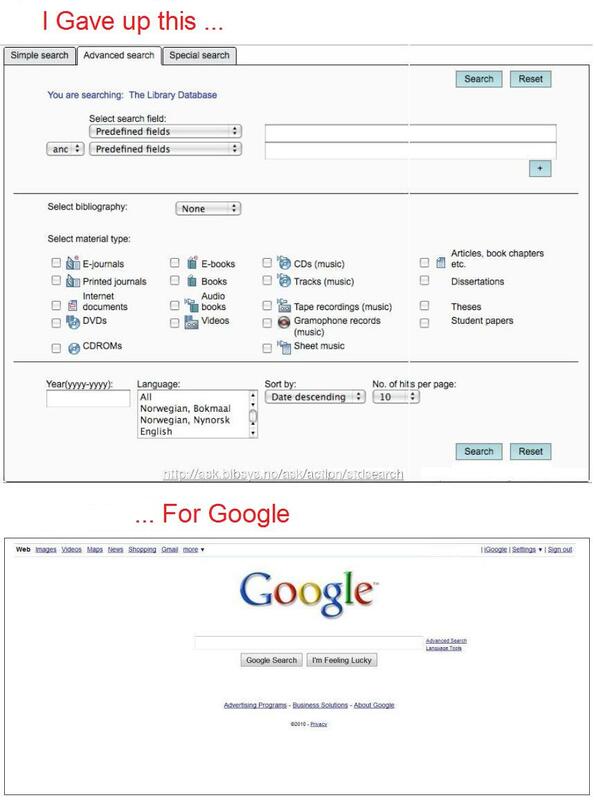 But in the slide following (For Google), she had an advanced Google Scholar search screen. I think substituting the simple Google search home screen as I’ve done captures the spirit of her presentation (and certainly its title!). Posted in Google, Libraries, Library Catalog, PicsYes, Uncategorized, Wide World. On Friday nights, my wife and I often watch a movie at home. A couple of weeks ago, I picked out 5 possibilities from the public library. At home, we “looked under the hood” for these titles on the Web, and none seemed too exciting, so I suggested that we look at some TED videos online instead. And that turned out to be just the thing for an enjoyable evening. Did the TED storytelling spirit come from India and Pakistan? I was sensitized to the centrality of storytelling – Age-old & modern – in South Asian cultures when I wrote about my idea that master-storyteller Salman Rushdie envisioned the Web. So, seeing that TED developer Chris Anderson “was born in a remote village in Pakistan, and spent his early years in India, Pakistan and Afghanistan” certainly makes me wonder — Did he learn to love story telling from that experience? Posted in PicsYes, Storytelling, TED, Uncategorized, Wide World. Like any self-respecting reader, I have a healthy collection of books, and consequently, an overflowing bookcase. I also live in Bombay, where every enemy of books – heat, humidity, dust, shortage of space – exists in abundance. As a result, half my library rests in a quiet corner in my mother’s apartment in Madras, waiting for the day when they can finally claim a place of their own in my home. I try to keep my books well, without tears, creases, folds, dog-ears or any form of marking. Given that much of my reading takes place on the trains and stations of Bombay’s local train system, this is far from easy to do, especially when one hand is occupied in desperately holding on to an available support for the duration of the commute. My success rate at book maintenance stands at about 40 per cent. Posted in eBooks, PicsNo, Uncategorized, Wide World. “Deviceful” – Wonderful word. I discovered it serendipitously in a thesaurus search for “creative” – An interesting story of the way words evolve, a Middle English word that’s out of common use now. I came across the word about the same time the iPad was launched and it seemed fitting for the occasion. I’m interested in the human element of the iPad story, especially talk about Apple Head Steve Jobs and Designer Jonathan Ive. Jobs, of course, was the center of media attention, with dozens of articles focusing on him. But the younger Ive also got mentioned a fair amount. Since about 2006, he’s been suggested as a possible successor to Jobs as Apple CEO, and with the iPad being the first big Apple Media Hype since Jobs health-related leave-of-absence in 2009, this talk is becoming more voluble. One day in 1992 a then-struggling Apple hired Tangerine [the small London-based consultancy where Ive worked] to toss around a few ideas for the emerging portable computer market. Ive took on the project while he was designing a new range of bathroom appliances for Hull-based Ideal Standard. On a grey afternoon he drove to Hull to present a new toilet to Ideal Standard. … Ive’s designs were rejected. Shortly afterwards Ive went to the US to present the new laptop to Apple. The firm liked his ideas so much they offered him a job … It wasn’t until Steve Jobs returned to take charge in 1997 that Ive’s career took off. Former Tangerine colleague, Peter Phillips, recalls: ‘Jobs realised he had a jewel in Jonathan. Another interesting tidbit on Jobs and Ive, that I haven’t seen discussed — They both have important “outside America” connections in their background — Ive, of course, is native to Britain. What’s not so well known is that Steve Jobs biological father was a native of Syria. Our debt to the World is striking. Posted in Apple, Elegance, PicsYes, Steve Jobs, Uncategorized, Wide World.